Reeperbahn Festival is less than a month behind us and there is still a lot of content we would like to share with you. Especially worth mentioning are the sessions focusing on the situation of German Rap Music. Together with Backspin we recoreded the sessions Status Quo Deutschrap and Frauen Im Rap II of the strand Sound & Society (Political Impact of Music) as well as Die Marke Fler of the session strand Recorded Music. As promised we keep you updated via our E · MAGAZINE on exciting reviews, interviews and Reeperbahn Festival insights. Today we offer three recordings mentioned above. Enjoy watching & reading! Is the representation and portrayal of women in rap still a problem worth talking about? Falk Schacht (Mohawk Entertainment, DE) talked to Marina Buzunashvilli (Die Marina, DE), Miriam Davoudvandi (splash! Mag, DE), Sookee (Musician, DE) and Salwa Benz (Radio Fritz, DE) about these and other questions in the session Frauen Im Rap II. Backspins recording is now available here. 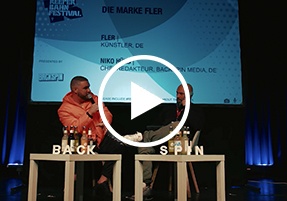 At Reeperbahn Festival 2018 the Berlin rapper Fler (Musician, DE) talked to Niko Hüls (Backspin, DE) about the beginnings of his career, how he managed to establish himself not only as a rapper but also as a businessman and why rap for him mainly was way out of criminality at first. To relive the session or to catch up, watch Backspin’s recording of Die Marke Fler. German rap music is more successful than ever, an info that has been outdated for years. But where does it really stand. Is it still a youth culture, is it a scene or is it "just" pop and mainstream? These and other questions were discussed by the experts Miriam Davoudvandi (splash! 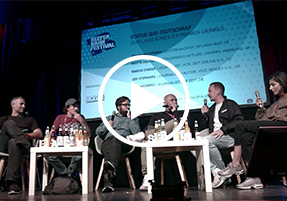 Mag, DE), Martin Seeliger (Universität Hamburg, DE), Marcus Staiger (Vice, ZEIT Online a.m., DE), Juri Sternburg (Vice, Noisey a.m., DE) and Lars Weisbrod (DIE ZEIT, DE). Go to Backspins recording of Status Quo Deutschrap. Music WorX Pitch 2018 – Apply Now! 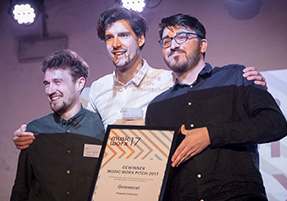 Reeperbahn Festival's partner Hamburg Kreativ Gesellschaft and the Ministry of Culture and Media Hamburg has opened the call for applications to the Music WorX Pitch 2018. They are looking for innovative startup teams from the music industry (and related areas) who would like to present their business idea to an expert jury, potential partners and investors. Furthermore, they get the chance to win €5.000,00. Apply here! The application deadline for the pitch taking place 27 Nov 2018 in Hamburg is 1 Nov 2018.